1938-57 10R Magenta. The SG number is given for a guide only. Lightly Hinged Mint. MLH - Mint Lightly Hinged – Good clean stamp with little or no hinge remainders. MNH - Mint Never Hinged. Mint – Average mint in a collectable condition. Interesting circa 1990 cover from Peshawar University, in Pakistan. 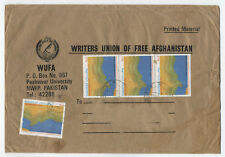 Writers Union of Free Afghanistan; a very interesting piece relating to the tumultuous history of the region. Child Welfare Week First Triangle Stamp. Pakistan Fdc 1961. No receiver. Quite a remarkable franking. New Constitution Triangular Stamp. Pakistan Fdc 1962. Pakistan Fdc 1961 Currency Changed 100 Paisa = Rs. 1.00 . Currency Changed 100 Paisa = Rs. 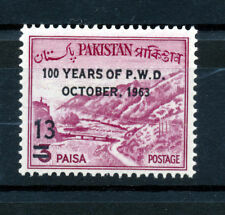 Pakistan Fdc 1961. Death Anniversary of Quaid-i-Azam Mohammad Ali Jinnah. Pakistan Fdc 1998. Condition As Per Scan. U. N. Forces in West Irian UNTEA. Pakistan Fdc 1963 & Stamp MNH. Pakistan Fdc 1978 St. Patrick's Cathedral Church Karachi . Satisfait ou remboursé. Port forfaitaire pour le reste du monde avec renfort et protection plastique . SIZE - 3 1/2 X 6". Hansen's Discovery of Leprosy. Pakistan Fdc 1973. PAKISTAN - 8 pages. NB The pictures are for illustration only and do not form part of this lot. PAKISTAN / BAHAWALPUR /. LOT NEUF / MNH. timbre neuf sans charniere. ajoutez-nous à vos Favoris. Turkish Republic Kemal Ataturk. Pakistan Fdc 1973. Railway Centenary Train Locomotive. 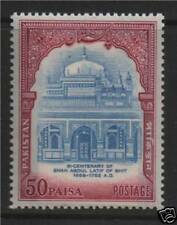 Pakistan Fdc 1961. Condition As Per Scan. Pakistan Fdc 1961 Railway Centenary Train Locomotive . MNH = Mint Never Hinged / Unmounted Mint. MM = Mounted Mint, may have hinge remnants. PAKISTAN 2012 MYGRATORY BIRDS SG,1460-1463 UN-MOUNTED MINT NEVER HINGED NICE AND CLEAN CONDITION. That's what we do and we think it's a good idea. We stand by our material. We're 2 retired collectors who do this for fun. We don't make any profit on this, but we can't afford to lose money either. Pakistan 13 Mint Hinged OG * - No Faults Very Fine!! !